Get a Free Battery Coupon with Every Watch Purchase! 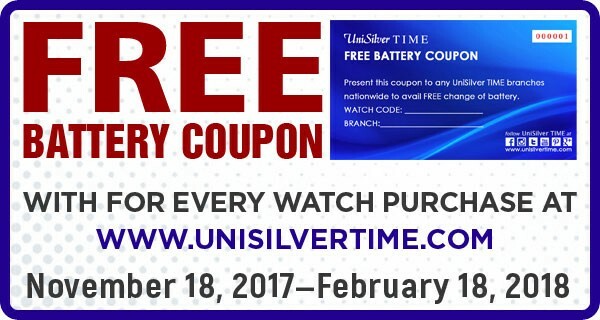 From November 18, 2017 until February 18, 2018, every watch purchased online at www.unisilvertime.com will have 1 FREE BATTERY COUPON! 1.) From November 18, 2017 until February 18, 2018, every watch purchased online through the UniSilver TIME website (www.unisilvertime.com) will have 1 FREE BATTERY COUPON. 2.) This coupon, along with the watch, must be surrendered to any UniSilver TIME branch to avail of the free battery. The battery replacement service is also free of charge. 3.) This coupon can only be used once. It can only be used for the watch purchased, the code of which is written on the front of the coupon. 4.) This coupon can not be used online. 5.) This coupon is not convertible to cash. 6.) This coupon has no expiration.